Construct PRO is a sandbox-designer, where you can assemble any structure using metal parts, bolts, and nuts and test its physical behavior. Post news Report RSS	Version 0.23: Unity Upgrade, Steam Workshop Support, Full Tutorial! First of all, it is worth noting that the engine was updated from Unity 4 to Unity 5 (yes, yes, this is the century of dinosaurs , but the project started a long time ago on Unity 4). The upgrade took a lot of time, graphics moving passed with song and dance, some items could not be configured properly. On the other hand, the game began to look somewhat better, so the upgrade was worth it. The physics engine also delivered a lot of trouble, I had to rewrite some functions of the main scripts, and set up physics in a new way, since Unity 5 uses the PhysX3.3 instead of PhysX2. And yes, it will improve the behavior of models on scene. In addition, I had a hard time with the sounds, interface, and many other little things. What has become the leading cause of Unity update? Steam Workshop! Yes, workshop support is running. 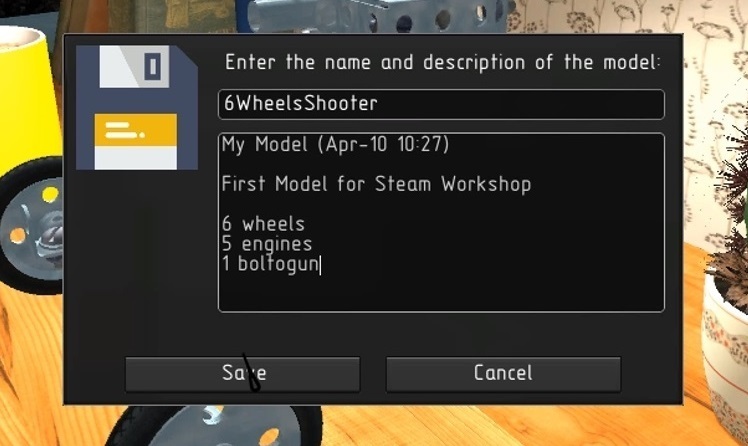 Everything happens in a simple way: You can send any saved model to the workshop with just one button in the menu. 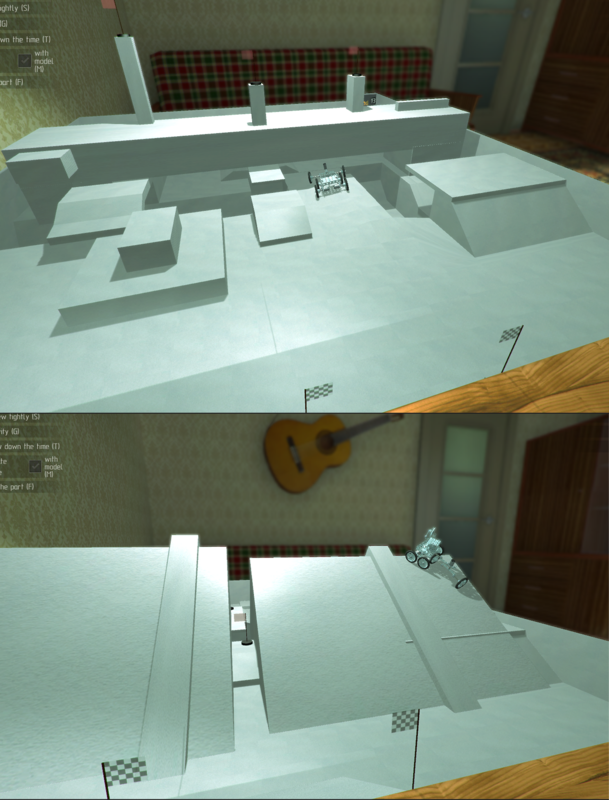 You can pick the angle for the thumbnail, and screenshots and videos can be added directly in the workshop itself. Downloading other player models is also easy: subscribe to an item, click refresh button in the main menu and load the model! You don’t even need to close the game. According to the players feedback I added full tutorial to the game. You will build your first model in stages and you will be able to drive it! Each step is accompanied by animation, all tutorial will take you no more than 10 minutes. Listening to councils of beta-testers, I added a gradual increased complexity. In the first round, you only need to get to the finish line, in the second round take down three flags. Then obstacles will be added. Now 15 rounds with new obstacles! Now saving the model, you can add a description to it (the default is the save time). Also a rename button appeared in the menu. By the way, this description will be sent with the model to the workshop if you want to upload it. In addition, the integrity test of the file is added. Saved models are now loaded gradually, and not entirely. Now you can align the part not only by 90 degrees, but also by 45, which makes the assembly of models more easy. Many players have the question "how to turn the model in the game, if there are no relevant parts?" First, after completing the tutorial, you build a rotatable model. Secondly, in F1 assistant you can watch two new videos: the first is how to use the workshop; the second (see below) - 7 ways to turn the model with ready-made examples. You can build any example from the video yourself, or show all your imagination and assembly something more cool! Some players assembled moving models even without wheels! In the full version of the game, I plan to add some, in my opinion, interesting game modes that will be the foundation for the campaign. Of course, a beta test and player reviews will be needed to understand which modes deserve attention. But before I start developing the full version of the game I need to add new parts, as well as some important changes in the assembly of models, for example, the ability to connect three or more parts with one bolt. Thanks for attention! Share your suggestions, ideas, positive or negative impressions, the game is built before your eyes!